The complaint procedure of the Human Rights Council is the successor of the so-called '1503 procedure' established by the Commission on Human Rights. It was a confidential procedure, under which the Commission could receive communications from victims or others acting on behalf of the victims regarding situations that ‘reveal a consistent pattern of gross and reliably attested violations of human rights’ in any part of the world. The 'new' complaint procedure as established by Human Rights Council Resolution 5/1is not radically different from the former 1503. It will have the same scope as the old procedure, and will address 'consistent patterns of gross and reliably attested violations of all human rights and fundamental freedoms'. Despite its shortcomings, the new complaint procedure has improved on a few points in comparison with the 1503 procedure. In terms of transparency, it now provides for the author of a complaint to be informed at various stages in the process, including when a communication registered, if it is deemed inadmissible, when it is taken up for consideration or kept pending, and at the final outcome. There are also provisions aimed at ensuring a more timely consideration of communications: the period between the transmission of a complaint to the State concerned and consideration by the Council should not exceed 24 months. The complaint procedure comprises of two working groups, the 'Working Group on communications' and the 'Working Group on situations'. Once an individual complaint is received, the Working Group on communications, after screening out the inadmissible complaints, will transmit communications to the States concerned to obtain their views on the allegations. The Working Group then assess the merit of the allegations of violations, including if the communication, alone or in combination with other communications, reveals a 'consistent pattern of gross and reliably attested violations of human rights and fundamental freedoms'. It will then either transmit the case to the Working Group on situations, keep the case under review or dismiss it. The Working Group on communications is composed of five members of the Human Rights Council Advisory Committee, who are appointed for a 3-year mandate which is renewable once. The Working Group on communications meets 'at least twice a year for five working days'. On the basis of information and recommendations transmitted by the Working Group on communications, the Working Group on situations presents the Council with a report on consistent patterns of gross and reliably attested violations of human rights and fundamental freedoms, but may also decide to keep a case under review. The Working Group on situations is composed of five representatives from member States of the Council, one from each regional groups. The members are expected to serve in their personal capacity for one year, renewable once. The Working Group on situations meets 'at least twice a year for five working days'. Discontinue the consideration of the case. Keep a situation under review, and request the State concerned to provide further information. Keep a situation under reviw and appoint an independent expert to monitor the situation and report back. Continue consideration of the matter in public. Recommend that the Office of the High Commissioner for Human Rights (OHCHR) provide technical assistance. The domestic remedies have not been exhausted, unless it appears that such remedies would be ineffective or unreasonably prolonged. The National Human Rights Institutions (NHRIs), when they are established and work under the guidelines of the Principles Relating to Status of National Institutions (the Paris Principles) including in regard to quasi-judicial competence, can serve as effective means in addressing individual human rights violations. On the stakes involved in the institution-building process and the transition from the 1503 to the new Complaint Procedure, see Meghna Abraham, A New Chapter for Human Rights, ISHR and the Friedrich Ebert Stiftung (Geneva, 2006), and in paritcular chapter 5 on the complaint procedure. 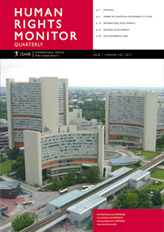 ISHR's Human Rights Monitor 2006 and Human Rights Monitor 2007. In our Publications section, you will also find reports on the institution-building working group which elaborated the basis for the new Complaint Procedure. Meghna Abraham, Building the New Human Rights Council, Outcome and analysis of the institution-building year, Friedrich Ebert Stiftung, Occasional papers, No. 33/ August 2007. Rachel Brett, Neither Mountain nor Molehill, UN Human Rights Council: One Year On, Quaker United Nations Office (Geneva, August 2007).